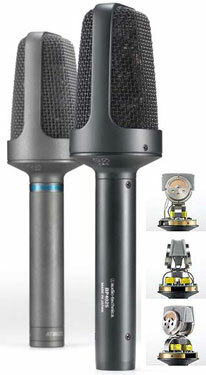 The PRO24 sets a new price/performance standard in stereo microphones. Designed for stereo recording on a budget, it provides the convenience of an affordable, high-quality stereo one-point pickup in a single microphone. A pair of cardioid elements in an X-Y configuration delivers the spatial impact and realism of a live sound field. It can be powered either by an internal battery or used battery-free with recording devices that provide plug-in power at the mic input. Supplied with a captive lead terminated with a mini-jack plug. Maximum Input SPL. :119dB SPL, 1kHz @ 1% T.H.D. Supplied Accessories: AT8405a Stand Clamp; LR44 battery; windscreen; soft case. A unique solution to the age-old problem of stereo recording. By eliminating the need to purchase a matched pair of microphones (expensive) and the associated complex set-up bars and adaptors (messy) to get professional results. The NT4's fixed 90 degree X/Y configuration and perfectly matched stereo condenser capsules let you record any source with immaculate stereo detail. 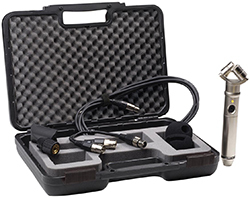 The NT4 comes supplied in a custom carry case with a windshield, XLR to mini-jack and dual XLR cables for portable solid state recorders with a mini-jack mic input or professional balanced XLR input connections. Acoustic Principle: Stereo Microphone. 90° XY placement. Each side comprises an externally polarised single diaphragm condenser transducer. Superlux’s compact, lightweight E523/D (balanced) and E522/B (unbalanced) stereo one-point microphones are designed for live field recording. They are equipped with a pair of closely matched microphone capsules to capture the spatial impact and realism of any sound stage. Especially suited to broadcast, pro-audio and digital location recording. 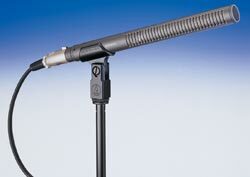 With 2 balanced XLR outputs, the E523/D works seamlessly with professional solid state recorders and video equipment. The E522/B is an unbalanced version with a lead terminated in a stereo mini-jack plug for use with our lower cost solid state sound recorders. The versatile E523/D operates on either battery or phantom power and comes with a 5m (16.5') cable [5-pin XLRF to two balanced 3-pin male XLR plugs]. The E522/B operates on a 1.5V AA battery and comes with one 3m cable [3-pin XLRF to stereo mini-jack plug] for general use with a solid state recorder and one 0.5m cable [3-pin XLRF to stereo mini-jack plug] for use on camera. 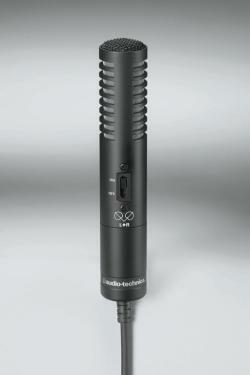 The Superlux E531/BCS a great little unbalanced stereo microphone. It is perfect for use with lower cost solid state recorders and video cameras that have a 3.5mm mini-jack microphone input. The E531/BCS is configured with an M/S stereo capsule arrangement for capturing reasonably natural live sound on a budget. The effective coverage angle can be switched between 120° (wide pattern for recording orchestras, choirs etc.) and 90° (narrow pattern for solo instruments, speech and dialogue). It won't set the world alight but it'll get you some pretty acceptable recordings if cost is an issue.